All the images in this post come from "De Gracieuse" no.16 1923. As this magazine was published twice each month, no. 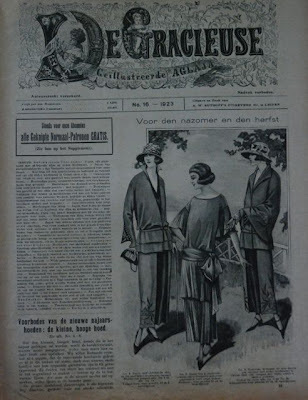 16 is the second issue of the month August. 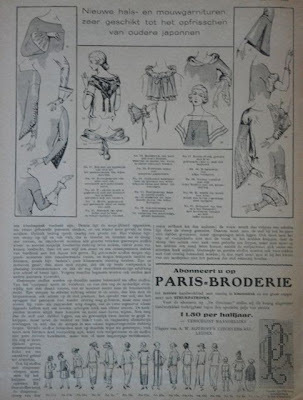 One of the things I love about 1920's Gracieuse is the used of photographs on the cover. In can be so difficult to get an idea of what these garments would really look like if all you have to go by are the often fanciful drawings. 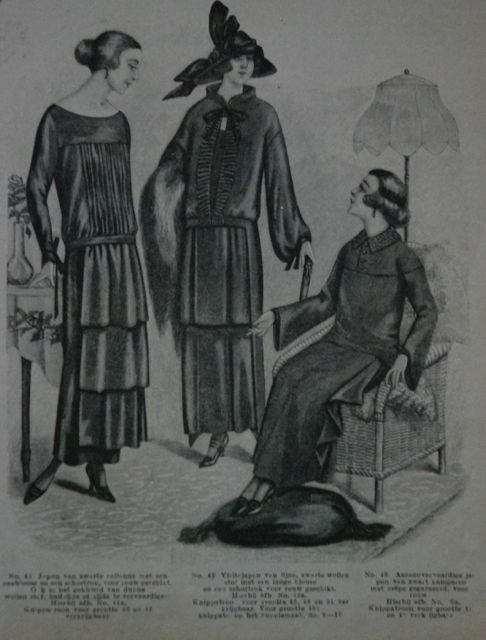 This particular dress is a "modern mourning gown". 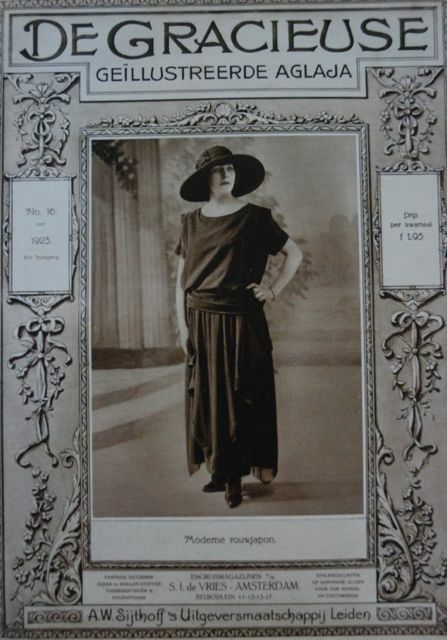 It shows the fashionable silhouette of 1923 quite well: a loose shape, belted well below the natural waist, the skirt which reaches the wearer's ankle decorated with dramatic draped points. I also rather like the dainty pointy toed, high heeled shoes worn with it. When you turn the page, the mood changes immediately. 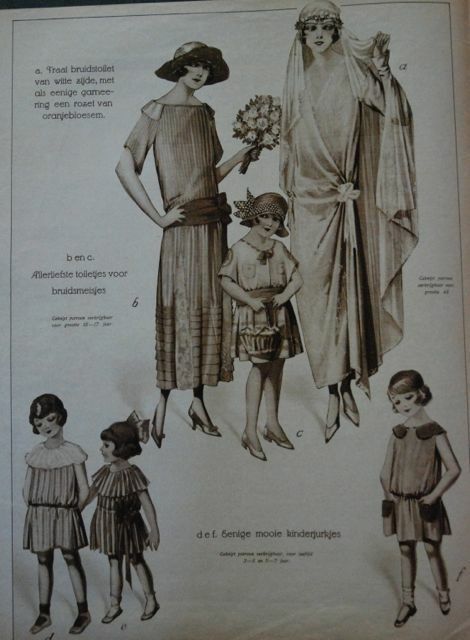 Here, we see a wedding dress and outfits for the bridesmaid and flower girls. 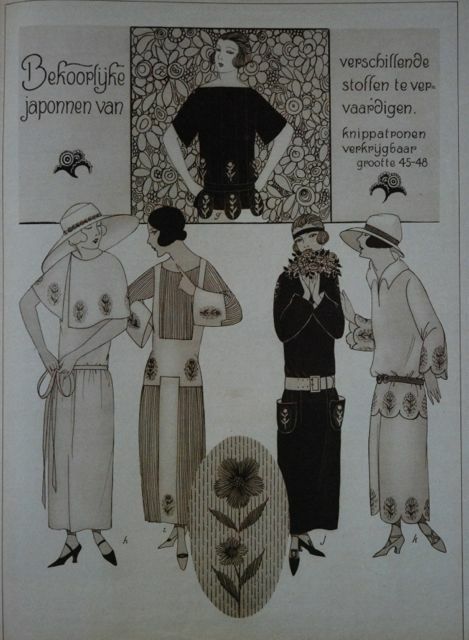 It is only after that and a page of embroidery patterns, that we come to the actual title page. 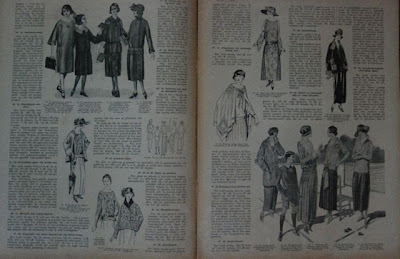 In the 1930's, this page would contain an editorial explaining the trends of the new season, here, we go straight to the describtion of the designs. 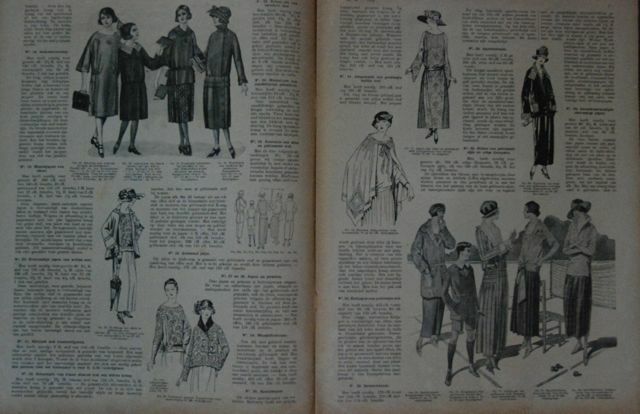 Dresses and suits for late summer and autumn. Like the blouse on the left: "An elegant blouse made from multi-coloured floral silk and crepe Georgette. 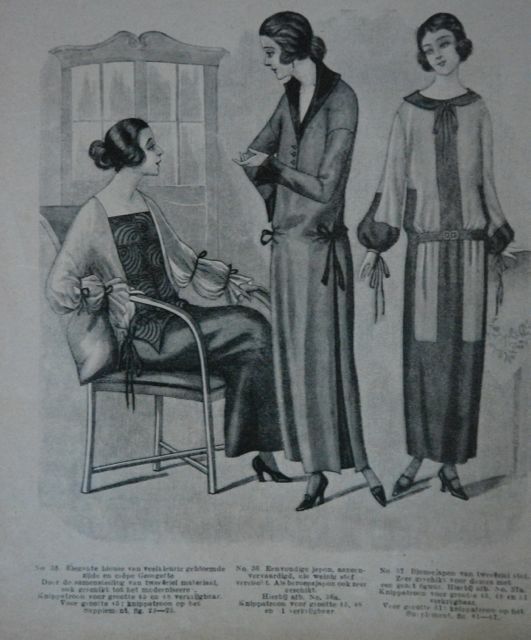 Because it has been made from a combination of materials, it is very suitable for updating an old garment". Here, the suit-dress on the left and the suit on the right come with patterns as does the dress in the middle, with the bias plaid. All the shapes look quite simple and straight-up-and-down. 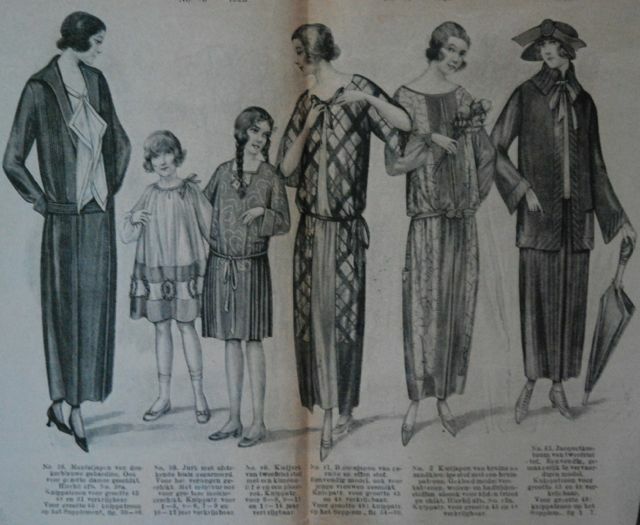 The final garment-with-pattern is the middle one in this picture. "A visiting outfit, suitable for mourning with a long blouse and an apron-skirt". 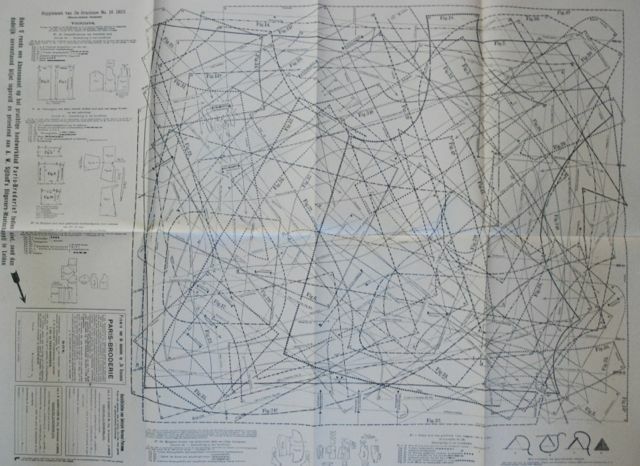 This is what the pattern sheet looks like. 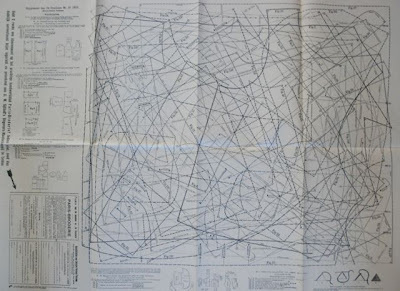 A lot less dense than the 1930's one but of course, it does contain fewer patterns. 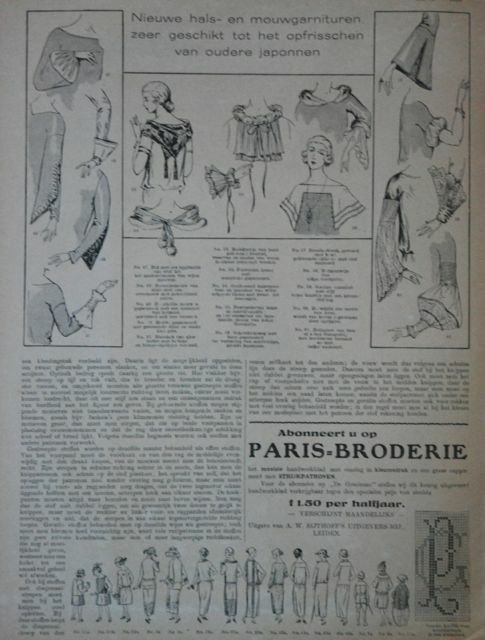 The little drawings seem to suggest that most garments are indeed simple and, dare I say, a bit sack-like in shape. Clothes had to last and be stylish at the same time (fast fashion really is a luxury of our days...) which is why this page was included, with collar and sleeve designs to update older dresses. It's interesting to see that all the sleeve variations are for sleeves which have been set into a fitted armscye, while most of the complete designs had either kimono sleeves or a dropped shoulder line. 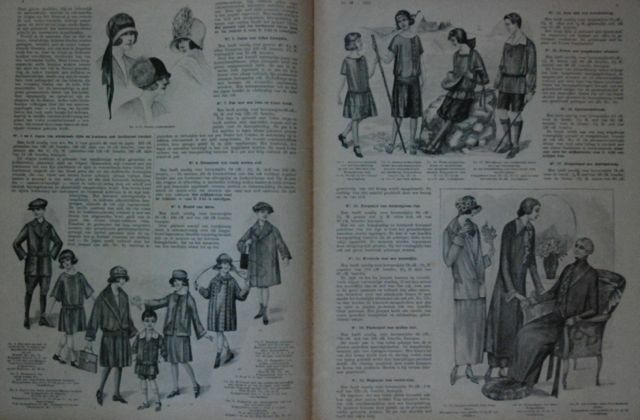 At the bottom of the page, you can see the back views of the designs on the previous pages. 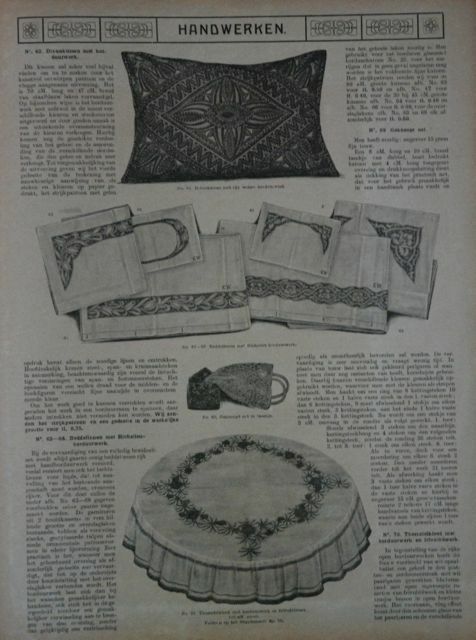 Then, there are several pages with craft projects. Delicate embroidery and lace-like crochet. Oh, and recipes and a feuilleton. None of which have interesting pictures. All decorated with embroidered flowers. I don't know why but Gracieuse always has distinctly different drawings on the front and back cover even though those also illustrate their designs. I love all of the photographs! Very inspiring! Do you know what the mesurements of those suplements were?